A snowy owl became trapped at Pennsylvania Correctional Institution Smithfield in Huntingdon this December. It was rescued by game commission officers. At least a few snowy owls have made Philadelphia International Airport their winter home this year. About a half-dozen of the large, white, majestic birds have recently been spotted in the area surrounding the runways, according to officials. "This is the first year in a while we've had a lot of them around," said Albert Polillo, a wildlife biologist with the U.S. Department of Agriculture based at the airport. The first sighting was last Nov. 27, and the owls will normally make their way back home to the Arctic Circle in late March or early April, he said. The economy parking lot is a popular hangout for one bird, said Polillo, who has been at the airport for 20 years. Snowy owls like airports because the wide-open grassy spaces remind them of home – despite the jumbo jets, he said. The birds spend the summers in the Arctic Circle, where they nest and snack on lemmings, the little rodents that favor the tundra and open grasslands. When lemmings are in plentiful supply, the owls will produce more eggs. The greater number of birds is referred to as an irruption, which usually leads to more of the owls flying farther south in the winter in search of food. Because of their size – they have wingspans of up to six feet – the owls are a risk to aircraft, said Polillo. In the winter of 2013-14, one owl was struck by a plane, which did not sustain any damage. However, the bird died, said Polillo. In an effort to discourage the birds, officials use small fireworks designed to harass wildlife. The airport also works with conservationists, who help track and occasionally trap and relocate owls deemed to be hanging out too close to the runways. This year's irruption, a sign of a healthy owl population, has brought hundreds of the birds into Pennsylvania, Delaware and the Chesapeake Bay, said Scott Weidensaul, co-founder of Project SNOWstorm, a nonprofit snowy owl research and conservation group. Most of the regional airports, including Allentown and State College, have snowy owls. So far this year, the group has moved more than 50 of the birds, he said. The relocation efforts haven't been without challenges. 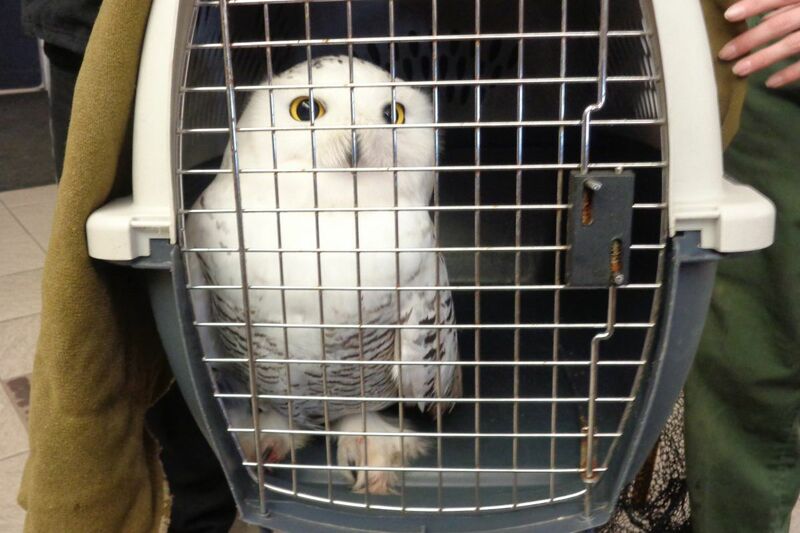 One snowy owl captured at the Philadelphia airport four years ago was driven to Lancaster County and released. It flew directly back, said Weidensaul. The group now tries to hold the owls for 24 hours before releasing them. One of the owls at the Philadelphia airport escaped the net set out to trap it after the battery used in the trigger mechanism failed, Weidensaul said. The owls have superior eyesight and can distinguish live prey from, say, a cat toy. To bait the traps, live gerbils or pigeons are placed in a fine mesh cage so the owls can't kill them, Weidensaul said. "They don't seem to care at all," he said about the pigeons. The gerbils — which are Weidensaul's pets — are currently happily running around the cage at home, he added. The birds go largely unnoticed by travelers or airport staff, said Diane Gerace, an airport spokeswomen. "The bird-watching community is aware they are out there," Gerace said. "The bigger problem with having the snowy owls at the airport is the people who come looking for them," said Polillo. There are strict rules regarding airport security, he said. "The police spend more time getting people away from the fence than we spend harassing the birds," said Polillo. One snowy owl known to hang out at the airport was found dead. "We don't know what happened to it," said Weidensaul. The bird, which was very thin, did not appear to have been in a collision. A necropsy will be performed on the raptor to help determine a cause of death, he said. "In urban areas, it is not uncommon for them to get into poison rats or mice," Weidensaul said.